1. Heat the oil in a large and sauté the onions and garlic, frying until softened. Increase the heat and add the minced beef. 2. Fry until browned, breaking down any chunks with a wooden spoon. Pour in the wine and boil until it has reduced a little. Reduce the temperature and stir in the mushrooms, tomatoes and sundried tomatoes. 3. Bring to the boil, cover and simmer for 1 hour stirring from time to time. 4. When cooled add the basil and parsley. Cook the gluten free pasta according to the packet instructions. Drain and divide between 4 bowls. 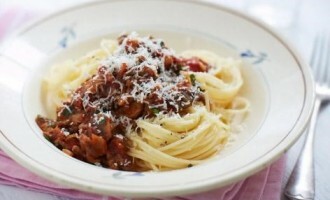 Ladle over the cooked bolognese sauce and finish with a sprinkling of Parmesan cheese.